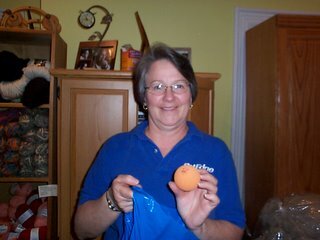 Good friend and longtime spinner, Carol came the rescue with new toys for Wanda yesterday. Carol works at Pet Edge. I called her at work yesterday so she got a whole bunch of stuff and brought it down to spinning group. 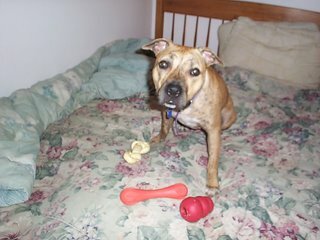 Here is Wanda with a selection of her new goodies. In addition, there is a Kong ball under the bed (I’ll be fishing it out later today), a tug toy on top of the fridge (she’d destroy it if I let her have it all the time) and a big bag of dog treats. This dog has it made. On the behavior front, I think she’s figured out that there are times that she can come with me everywhere I go and others that I’m going to close a door and leave her alone. All in all, she seems to be taking it very well. BTW, I’ve made some really funny discoveries about Wanda. 1. She doesn’t like the rain! She spent our entire walk this morning trying to duck into every doorway we passed. 2. She actually smiles. We’re not talking about the usual pit bull open mouth smile. She actually lifts her upper lip and does a dog smile! I tell you, it sets you back some until you figure out what it is. If you don’t know any better, it looks like she’s snarling. 3. She likes me to watch her play. She enjoys it if I play with her but mostly it is enough that I’m there. Also, I come in handy when the toy falls down between the wall and the bed. It’s a lot like when a baby throws stuff on the floor just to watch you pick it up. Yes, I understand that I’m completely whipped for this dog. I dyed some more yarn this morning. It is currently out on the back fence getting wetter than it already was. I’m just going to leave it there for now. There’s nowhere to hang it in the house and it should stop raining shortly. Yesterday, all these showed up for the Knit Out. It’s great that we’re getting all this stuff in but where am I going to put it? I’m hoping Susan will let me take some of it down to Windsor Button. For now, I’m going to see if I can con my brother and Big Nephew into taking it down cellar for me. So, to knitting (that’s right I knit, don’t I?). What do yarn shop owners all knit this time of year? Samples! I’m seriously in love with my new yarns. I’ll get a picture tomorrow when I’ve got a few more done. So, that’s it from here. Stay dry if you are in the Northeast. I’ll be here knitting hats and working on the Knit Out program. 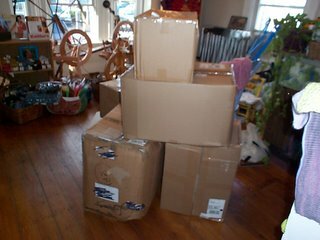 No, it is three huge boxes of eyelash yarn. I don't know what we're going to do with it but we'll think of something. T-shirts and bags should be here in about two weeks. I was having a discussion with someone about what the phrase "down cellar" meant in terms of your geographical origins. Help out this conversation! Are you originally from Maine, NH or VT? Also you should see the weather we have been having out here in WI. I have never seen weather like this. It has been severe rain and thunderstorms for 3 days! The streets are flash flooding. The thunder and lightning and nearly continuous. In fact just yesterday lightning split a 100 year old tree behind on of the LYSs here. Foretunately the tree did not fall onto the building. Hey Omly-I'm from Massachusetts, Beverly on the Nor' Shore. I actually stuck in the 'down cellar' to yank Melissa's chain a bit (she's from Michigan). She didn't bit, though you did. Tee hee. See you in a couple days.